Keeping Ducks in the garden is growing in popularity. 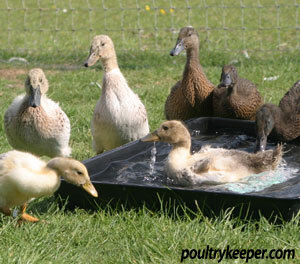 Even without a pond, you can keep domestic ducks happy with a tub that is emptied and refilled daily with fresh water. Any sort of tub will do, providing the ducks can get in and out and have enough room to turn around in it, they will be happy to use it. Ducks do need to be put to bed at night but many develop a routine and will often go into their house when it gets dark if that is what they have been used to. If they don’t, they are very easily herded and can be ‘steered’ by holding out your arms and walking behind them. Ducks are generally quiet, although Call ducks live up to their name and are more vocal so it’s worth remembering this if you have close neighbours. You can keep more than one drake in a flock of ducks and typically 4 or 5 ducks to a drake will not cause problems but they do need to be monitored closely during the breeding season to ensure they are not stressing the females too much. Before the second World War, ducks were on track to become the biggest egg producers. It was only the relatively recent advances with hybrid hens and their tolerance of intensive battery farming systems that has meant the duck has taken a bit of a back seat, however many ducks lay a very respectable amount of eggs that can be a fair size larger than a chicken’s egg. Trials during the 1920’s of Khaki Campbell ducks, amongst others established that they were able to produce more than 250 eggs per year without any special conditions! Compare this to the majority of pure bred chickens, throw in the extra hardiness of ducks, the bug exterminating power in the garden (without scratching every loose bit of soil onto the garden path like chickens) and their individual personalities and you’ve got a fantastic all-weather egg laying machine that can give your pure bred chickens a real run for their money! 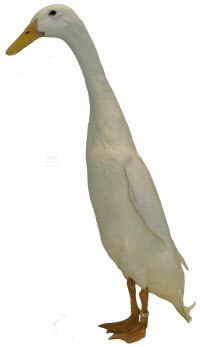 All breeds of domestic duck are descended from the common Mallard with the exception of the Muscovy duck. From the sweet little Call duck to the giant Aylesbury or the tall Indian Runner duck, the Mallard you often see on ponds and lakes is their ancestor. The domestic ducks we have today were developed for a purpose – The Call to bring wild ducks in for the hunters, the Aylesbury for its meat, the Indian Runner (shown in the photo to the right) for its ability to be herded vast distances across paddy fields to mop up insects. More recently, we have read of Organic Vineyards in South Africa doing the same, using Indian Runner Ducks to perform the same pest control duties. Each breed has had its purpose over time but for now, most of us are happy to keep a few ducks in our back gardens as pets for their beauty, and their funny antics with the added bonus of a few eggs for the table. We have a Keeping Ducks FAQ section (below) which should answer most of your questions and a Beginners Guide To Keeping Ducks in the general ducks sub-category which provides a lot of useful information for you to get started. Frequently Asked Questions about keeping ducks. From what to feed ducks to their housing requirements, this section should answer commonly asked questions about keeping ducks. This section contains general articles about keeping ducks that don’t belong in any other category. From our Beginners Guide to vent sexing ducklings, there is a wide range of information about how to keep ducks in this section. This section contains information about incubating and hatching duck eggs, either by using an incubator, or with a broody hen. More general information about incubation can be found in the incubation and hatching section for chickens.